The year was 1891 when George A. Nielson began to publish The Municipal Miscellany in Arnprior, Ontario. For reference, Canada had yet to celebrate its 25th year of independence, Queen Victoria would sit on the British throne for another decade, and the Model T was still nearly two decades away from production. While The Municipal Miscellany was a bold endeavour, Nielson divested himself of the magazine after only one year. In 1892, the clerk of Elgin County – Kenneth Weir (KW) McKay – took over the publication, renamed it The Municipal World, and moved the entire operation to St. Thomas, Ontario. The rest, as they say, is history … Municipal World is currently entering its 125th year of publication – the world’s longest continuous run for any monthly magazine in the municipal sector. Any look at the publication’s history should be framed with those goals in mind; the world has changed significantly over the last 125 years, and Municipal World has evolved with it. However, despite that change, adherence to key ideas shows that, in many ways, the more things change, the more they stay the same. Content development has been one of the most significant changes to the magazine since the late 19th century; even long-time readers would be unfamiliar with the earliest publications. But, while change has been a constant, it is also fairly consistent and instructive if considered in its historical context. Early issues focused on specific topics: news aggregation, the delivery of legislative amendments, and the minutes of various municipal conferences (a trend that continued for over a century), as well as a regular legal and engineering department – the latter emphasizing the fledgling good roads movement and the technical side of delivering quality roads, sewers, and municipal services such as water and electric street lighting. However, a defining aspect of the early magazines was the Question Drawer – a long-lasting feature of Municipal World that answered up to 1,500 questions a year in its heyday. KW McKay ran the publication until his death in 1941, at which point his son, William Scott (WS) McKay, took over editorial control. The changes to the publication were subtle, but important. While staying true to the roots of the publication related to matters of legislation and jurisprudence, the younger McKay began to diversify the subject material, examining important topics such as education and community health. The tradition continued with WS McKay’s successor, Michael John Smither, who assumed the position of editor in 1974. Like his predecessors, he maintained a strong focus on providing information related to municipal conferences and an emphasis on legal and legislative elements, with a particular focus on municipal conflict of interest. However, topics that were relatively novel – surrounding municipal human resources, planning, and specialized education for municipal staff – began to supplement that tradition. More recently, the magazine’s content has evolved once again, under the leadership of executive editor Susan M. Gardner. Less focused on the technical, legislative aspects, today’s magazine examines a much more diverse set of topics that includes sustainability, municipal finance, planning, culture, heritage, environment, technology, and more – all while still hanging on to the roots of good governance. The overarching goal, however, has always been the same: give the readers not only what is current, but also what is needed. The early editorial focus on engineering, particularly on good roads, was because this was a significant issue for many readers – in some places, roads were little more than dirt tracks, and municipal services (such as sewers and electric lighting) were almost non-existent. Amendments and meeting minutes were published because the magazine served as one of the few ways to disseminate such information. Today, statutes and meeting minutes can be found with the click of a button; more specialized staff mean that basic legislative questions are no longer novel; and many public services are now more about refinement than implementing from scratch. However, while the topics of yesterday are no longer current, today’s municipal governments (whether elected officials or staff) are expected to know – and do – more. Topics such as urban planning and heritage preservation have emerged as important local issues; environmental concerns have evolved far beyond basic sanitation to prevent disease (a popular early subject – particularly in the 1890s); and technology is evolving at an increasingly rapid pace – with new tools emerging that weren’t even being remotely considered five years ago, let alone 125. So, while municipal matters have changed, the role of Municipal World in sharing that information is no less important today than it was in 1891. The goal of being a municipal authority has led to the development of several other important areas of service, many of them with long, varied histories, and roots that can be traced back to the flagship magazine. One of the earliest departments to flourish was the stationery department, offering a wide array of materials – everything from forms supporting municipal administrative functions, to election supplies, to maps and calendars – all produced and sold out of the St. Thomas office. Providing election essentials – such as ballot boxes and voting booths – predates WWI, at a time when Ontario municipal elections were held annually in most places. Service in this area continues to this day. Another major facet of operations has been the book department – again, with roots in the 19th century. The earliest publications included The Assessor’s and Collector’s Guide, Rate Tables, The Clerk’s Guide, and several others – the primary focus being the consolidation and annotation of applicable legislation in order to provide pertinent information for municipal administrators. Over the years, several other “technical” books (such as Fences and the Law; Corporation, Council and the Councillor; and Remedies for Municipal Malpractice) and the text of several other important statutes were published. Today, over 30 books on a diverse range of subjects are available to help inform the work of the municipal council and administration, as well as individuals and organizations interested in governance and the future prospects for their communities. One of the “newest” departments is the Job Board service, posting employment positions for municipalities and related organizations across Canada. While the process occurs largely online today and is done through the website, Twitter, and Municipal World Insider email service, the tradition of making such postings available to subscribers began in December 1948, when job postings began appearing in the magazine, and has carried on in various mediums for over 65 years. Of interest, several other departments and features have come and gone, including a calendar of important municipal dates, the support and recognition of graduates of various municipal administration courses (including the award of a trophy for highest academic achievement), and the Canadian Municipal Code (breaking new ground as the first Canadian company to be awarded a contract for codifying municipal by-laws). 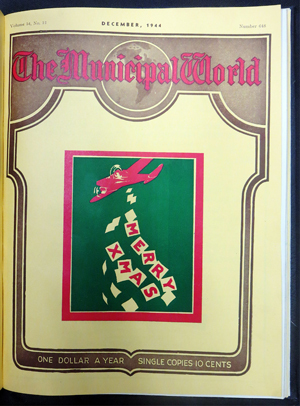 The Municipal Miscellany started as a small publication – which actually began its circulation completely gratis, with sample copies being given to Ontario municipal councils and clerks as a way of drumming up support for the fledgling publication. Today, the operations have expanded significantly, with distribution of the paid-circulation magazine and municipally-related books across Canada and in nearly 20 countries spanning five continents. However, the mission of bringing readers a world of coverage is not a recent advancement, actually dating back to the early 1890s. In early years, coverage would come in from across Canada, the United States, the British Empire, and major cities in Europe – no small feat considering how long it took information to travel at that time. Whether drawing on the United Kingdom for guidance on municipal ownership of essential services, or sharing details of early voting machines (New York City, 1900), readers were informed of best practices, useful information, and novelties from around the world. That tradition has continued, with Municipal World continuing to draw on expertise from across the globe, highlighting best practices and their application to Canadian municipalities. The topics may have changed, but the goal remains the same. One of the most fascinating and unique challenges has been balancing municipal topics against significant events on the world stage. Major events affected Canada and the world around it over the course of the 20th century: WWI and WWII, the Korean War, nuclear proliferation and the Cold War, the great depression, and the Charter of Rights and Freedoms, to name a few. These were all significant issues that played out at the national and international levels, while still impacting municipal governance. The hallmark of the publication has always been information and balance – avoiding sensationalism, while providing the knowledge to deal with sometimes challenging subjects. For example, after the outbreak of WWII, one of the first articles published in October 1939 examined how war measures impacted municipalities under various statutes; subsequent issues provided additional information that municipal leaders needed to know – about personnel movement, post-war planning, financial matters, as well as advertisements for Victory Bonds – all balanced against the regular, day-to-day operations of municipalities. Other examples of that balance include a series of articles on nuclear disarmament in the 1980s; any of a number of articles on municipal administration during the depression era; and, most recently, an editorial on the growing unrest in Hong Kong and how it relates to Canadian municipal elections.